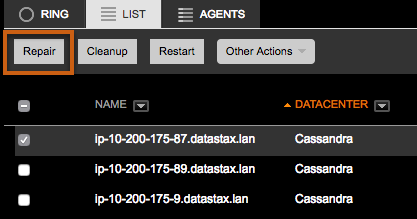 Disable the NodeSync Service and disable the Repair Service if they are running. Warning: Do not run a manual repair if the Repair Service or NodeSync Service is active. Manual repairs fail if those services are active. Optional: If applicable to your environment, select Only use nodes in the same datacenter for the repair. This option is analogous to using the /en/dse/6.7/dse-admin/datastax_enterprise/tools/nodetool/toolsRepair.html#toolsRepair__local option for nodetool repair. Otherwise, nodes in other datacenters within a multi-DC environment are used in the repair as appropriate. Optional: If applicable, select Only repair this node's primary range. This option is analogous to using the /en/dse/6.7/dse-admin/datastax_enterprise/tools/nodetool/toolsRepair.html#toolsRepair__partitioner-range option of nodetool repair. 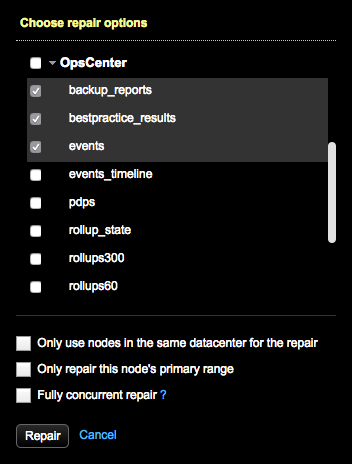 Optional: To run the repair simultaneously on all replicas for the node's range, select Fully concurrent repair. This option is analogous to using the /en/dse/6.7/dse-admin/datastax_enterprise/tools/nodetool/toolsRepair.html#toolsRepair__full option of nodetool repair.